The number of international players in the global terahertz components and systems market is increasing, leading to a high level of degree of competition. Some of the vendors operating in this market include: TeraView, NEC Corp, Bruker Corp, Advantest Corp, Techcomp Group Ltd., and Menlo Systems GmbH. These vendors, in an attempt to expand their product portfolio, are investing aggressively in research and development activities, states a report published by Transparency Market Research (TMR). Players in the global terahertz components and systems market are competing with each other on the basis of advancements and innovation, which is ensuring a continued growth of the market. Competition among players also prevails in terms of product pricing. Overall, the market is expected to gain profit in the coming years. According to TMR, the global opportunity in terahertz components and systems is expected to rise from US$56 mn in 2014 to US$415 mn by 2024, expanding at a whopping CAGR of 25.90% from 2015 to 2023. In terms of components, the terahertz sources segment led in 2014, but the terahertz detectors segment is expected to lead by 2023. On the basis of systems, spectroscopy-based systems are in high demand and will continue to be, in the coming years. By geography, North America not only led in 2014, but is likely to remain a dominant regional segment throughout the forecast period. North America accounted for 45.2% of the market but is expected to lose its share to Asia Pacific in the coming years. Asia Pacific is anticipated to account for 23.2% by 2023, rising from 18.5% in 2014. Advancements in this technology coupled with the increasing applications of are behind the growth of the market in the region. Terahertz radiations are becoming extremely popular in biology as they do not cause ionization of biological tissues. They are extensively used for non-destructive testing. “The applications of this technology are increasing as a number of industries are making use of terahertz radiations for process control monitoring and quality check,” said a TMR analyst. Since these radiations have low photon energy, terahertz imaging solutions are widely accepted in medical applications and this is boosting the demand for terahertz components and systems. Terahertz technology has also found its applications in molecular spectroscopy and space science. All these factors are driving the growth of the terahertz components and systems market. 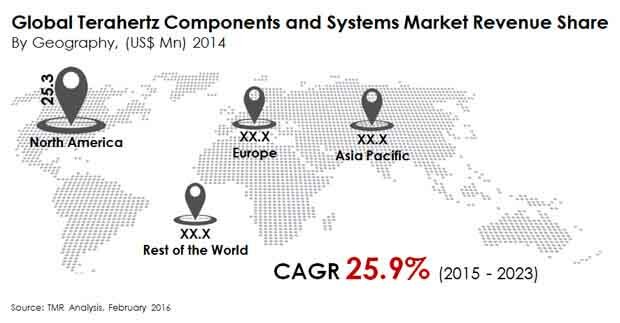 There are a few challenges faced by the terahertz components and systems market. A key challenging factor is the limited penetration level. A lack of awareness regarding the benefits of terahertz technology is expected to be another challenge for the market. In addition to this, a dearth of skilled professionals to manage these devices is expected to pose a problem for the market. On a positive note however, it is expected that terahertz components and systems market will find immense potential for growth in the industrial process monitoring segment. The terahertz technology is applied to detect abnormalities, foreign material inclusions, and damages. They can also detect hydraulic fluid ingression and mechanical impact delamination and disband.